Under a special presidential program in the Russian Far East, rare Amur tiger cubs are rehabilitated and released back into the wild. However local WWF specialists argue that a different approach is required to successfully rear tigers. Before crossing the Amur River to Chinese territory, Ustin, the young alpha male Amur tiger, suddenly showed up on the central beach of Khabarovsk. He swam to the centre of town from Bolshoi Ussuriysky Island, which borders China, strolled around a little then swam back to the island, where he disappeared beyond the frontier. Like his brother Kuzya, who has been roaming northern China since October and apparently does not intend to return, Ustin is one of five tigers that were set free according to a presidential program in the beginning of the year. Kuzya was set free by Russian President Vladimir Putin himself. Regional experts agree that animals, and males especially, must explore their territory and that Ustin can still return to Russia in the winter. However, the fact that the tigers reared in the presidential rehabilitation centre show little fear of humans makes WWF (World Wildlife Fund) experts, as well as specialists from the State Non-profit Amur Tiger Society, wonder if the rehabilitation program is doing the right thing. 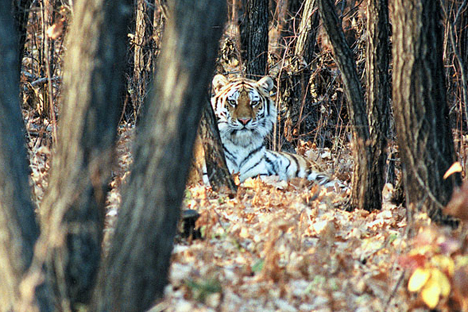 “If the tiger remains in the forest, then it will be a success,” says Pavel Fomenko, WWF coordinator in the Far East. The tigers that approach humans are called “conflicted,” and the reason, experts believe, partially lies in the fact that Russia still does not have a single and scientifically credible practice of returning man-reared tigers to nature. Hunters found the five tiger cubs - Ustin, Borya, Kuzya, Ilona and Svetlaya - in the taiga two springs ago. Poachers had killed their mother and they could have died of hunger or cold. According to the International Fund for Animal Welfare (IFAW), 40 tigers are killed in the Far East every year. The tiger cubs were initially nursed by collaborators from social organizations and were then given to the centre for rehabilitation and reintroduction of tigers and rare animal species in the town of Alexeyev in the Primorsky Territory. “The rehabilitation centre is a compound of enormous aviaries that people are not allowed into,” says Vyacheslav Rozhnov. The centre was financed by the Russian Geographical Society under the presidential program for the study of rare species, which was launched in 2007. The program's operator became the A.N. Severtsov Institute of Ecology and Evolution in Moscow, where Rozhnov is deputy director. To illustrate his point, Fomenko describes how live deer were brought to the tigers’ enclosures so that they could learn to hunt and procure their own food. According to Amur Tiger Non-profit Society Director Sergei Aramilev, the principal misbelief is that the rehabilitation's fundamental aim, so to speak, is to teach the tiger to hunt wild animals. Aramilev thinks that the tiger has an innate hunting instinct, which is why in the wild the female does not teach the cubs how to hunt, but just rears them until they reach a size at which they will be able to catch and kill large prey by themselves. Rozhnov says that it is better to rehabilitate the tiger cubs coming to the centre and prepare them for the return to the wild. However, Far East experts believe that the approach to the tigers should be differentiated according to their age. “There must be a precise algorithm,” says Aramilev. “The tiger cub is three months? Well then, to the zoo. One year? Then to the rehabilitation centre. The rehabilitation must be carried out according to a certain program. And so on.